Unforgettable art, crafts and designs begin with bold, vibrant liquid chalk markers from ZAM-Art. There's nothing quite like making fun, unique art with versatile ZAM-Art Liquid Chalk Markers. With 10 gorgeous colors and 6mm reversible tips for fine strokes or wide lines, you can draw, sketch, trace, color, or come up with something absolutely new and exciting-and all in colorful detail. ZAM-Art Liquid Chalk Markers are premium, high quality markers made to work on almost any non-porous surface, including glass, paper, chalkboards, whiteboards, and so much more. In fact, you can use them for children's art at school, on restaurant bistro boards, or even on festival or holiday decorations. Certified safe by US and European Art material authorities, ZAM-Art markers are safe, nontoxic and 100% environmentally friendly. They're also so handy that they can be used by art students, teachers, restaurant owners, teachers and business owners. Don't settle for just any random art supplies filled with colored pencils; get premier liquid chalk markers from ZAM-Art and reduce the mess while enhancing the fun. Make your next school project, family fun day, or business venture more fun by adding a little pop of color. 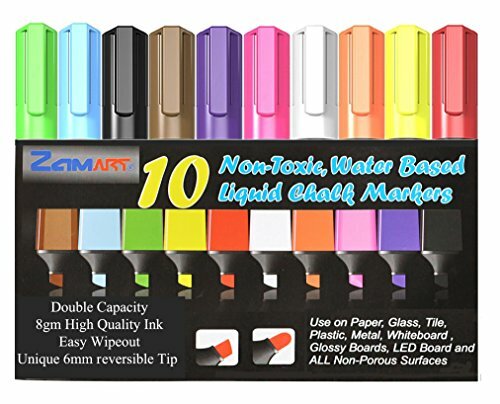 Get ZAM-Art Liquid Chalk Markers by clicking 'Add to Cart' above. KID FRIENDLY CREATIVE COLORS: No art set for kids is complete without 10 versatile chalk markers that take any art project from average to unforgettable! Let them create happy birthday banners, sketch cute dinosaurs and draw anime, then erase it and do it all over again. MULTIPURPOSE VERSATILITY: Liquid chalk markers are not only fun, they're also extremely useful. Use them to write up a menu on a bistro board, for arts and crafts as a hobbyist, track holidays or birthdays on a calendar, or even using them for scrapbooking! SAFE & EASY TO CLEAN: We made our water-based liquid chalk markers with 6mm reversible tips so they last twice as long as most art supplies and so they won't leak ink or leave smudges. The fine point also allows you or fellow writers or crafters to create gorgeous art with maximum creativity. SATISFACTION GUARANTEED: We pride ourselves on having made the best liquid chalk markers on Amazon, which is why they come backed up by our 90-day money back guarantee. If you aren't happy with your order for any reason, contact us today for a full refund. If you have any questions about this product by ZAM-Art, contact us by completing and submitting the form below. If you are looking for a specif part number, please include it with your message. Edible chalk "Bamboo"-"SAWN BELGORODSKIY" 200gr . Edible chalk, Natural Chalk,"No Standart" 200gr.